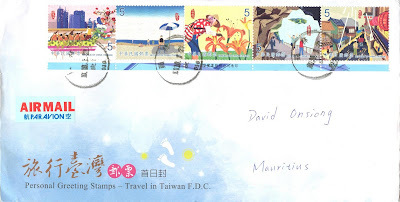 Mauritian Philatelic Blog: Travel in Taiwan! 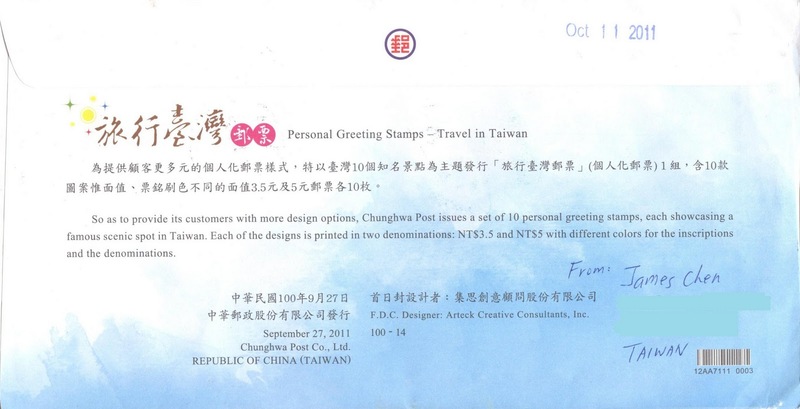 So as to provide its customers with more design options, Chunghwa Post released a set of stamps on September 27, 2011 centering on travel in Taiwan with ten designs, with each of the designs depicting a famous scenic spot of Taiwan thus taking us on a round-the-island tour, and printed in two denominations: NT$3.5 and NT$5. - Love River in Kaohsiung. After an environmental restoration, Love River has become a new spotlighted feature of the city. Th e dragon boat races held during the Dragon Boat Festival captures perfectly the passion and energy of southern Taiwan. - Kenting. Kenting is a hot tourist destination in the summer. Lazily sunbathing under the blue sky or sitting under an umbrella is a perfect way to enjoy a hot summer day on the beach. - The Liushidan Mountain. The yellow sea of daylilies there creates a mystical Shangri-La in Hualian. The stamp depicts a plainly dressed farming woman happily and diligently picking daylily flowers. - The Taroko National Park. The Park offers a treasure chest of geological resources. Two visitors joyously gesturing on a winding trail while marveling at the craftsmanship of Mother Nature.